With perhaps two of the World's best known explorers setting off from the South West of England, it is no wonder that Polar Exploration has become extremely popular with collectors in the past few years. Both Sir Walter Scott and Sir Ernest Shackleton have strong connections to the region and artefacts connected to them are still to be found. 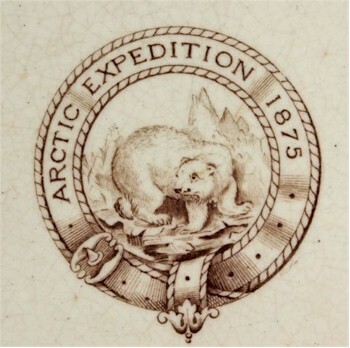 A close-up of the motif displayed on a British Arctic Expedition 1875 earthenware dinner plate. An autograph album signed by Edward Adrian Wilson and several other crew members of the British Antarctic Expedition aboard the Terra Nova 1910-1913, sold for £3,500. A British Antarctic Expedition 1921 'The Quest' handpainted dockyard sign with signature EA Shackleton, sold for £1,800 at auction. 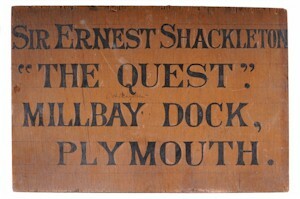 A handpainted dockyard sign signed by Sir Ernest Shackleton, fetched £1,800 in the same sale. The epic feats of endurance that both Shackleton and Scott achieved and eventually lost their lives attempting are still as inspiring and emotive today as ever. During the 19th century many expeditions to the poles were attempted, only to have been defeated by the severe weather and pack ice. Records of these journeys are extremely rare and, therefore, sought after at auction. One of the more unusual items of exploration to emerge has been a small collection 19th century magic lantern slides with handpainted Polar landscapes.